Find out why we are a cut above the rest and the first choice of students and parents alike for quality in-home music lessons. 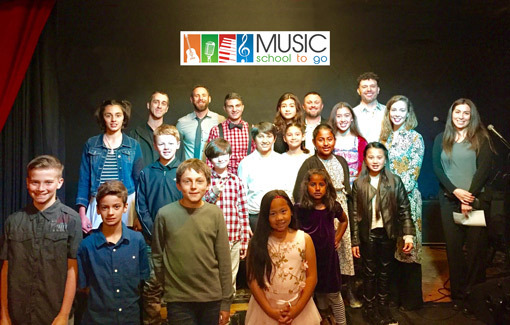 For more than 15 years, Music School To Go of the Conejo Valley has been providing the highest quality in-home music lessons to children and adults of all ages. As a family owned and operated music school, we take pride in the outstanding quality and service we provide to our community. Our expert instructors are highly qualified professionals adept at teaching students of all ages and ability levels, beginner through advanced. Music Lessons for the Entire Family - All Styles. All Levels. We teach it all! One 30, 45 or 60-minute music lesson each week. One-On-One Lessons - No pressure and learn at your own pace. Fantastic Instructors - We only hire the best! Flexible scheduling with vacation allowances. At least one optional recital per year. We have Experience. We have been helping children and adults learn and improve since 2004. Family Owned & Operated - We are not run by a corporation! A wide network of highly experienced and talented instructors which enables us to skillfully match your family with a music teacher of your preference. Convenient Payment Options - Families can pay for lessons by check or credit card. You won't need to fight traffic and drive to or from lessons or wait during lessons. Students learn on their own instrument in the comfort of their home with the best teachers! At Music School To Go, our goal is to help students of all ages develop a lifelong love and appreciation of music with fun and exciting music lessons that develop skills, build confidence and promote happiness. Thinking of giving someone the gift of music? Gift certificates are available for as many lessons as you care to offer. Treat your loved ones to a gift that truly keeps on giving. (818) 914-4950 or send us an email. Are you a music teacher interested in teaching in one of our locations? Contact us. only shares his knowledge, but his passion for music as well." only is he a great teacher, he has also become a part of our family. Thanks for the great match Music School To Go!" their teachers and I can tell that they really care about my kids too. all, I love the convenience of lessons at home!" Music lessons near you: Private music lessons with the best teachers. Driving is inconvenient and fighting traffic is a struggle. Leave the worry to us. All Music School To Go teachers travel to give you in-home private music lessons. No need to drive to and from a school or studio and wait for lessons to end. We bring you the best experience right to your door. Serving Calabasas, Agoura Hills, Oak Park, Westlake Village, Thousand Oaks, Lake Sherwood, Newbury Park, Simi Valley, San Fernando Valley, Woodland Hills, Tarzana, Encino, Sherman Oaks and more!